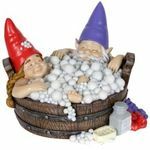 Give your garden a bit of companionship or romance with our fun couple gnomes. These lovable statues come in male and female sets that you can mix and match. Place them together in your garden or put one in each corner. 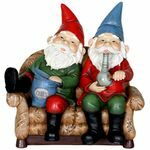 Browse our selection below and buy garden gnomes online today! 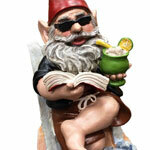 Our customers love our metal gnome garden stakes. 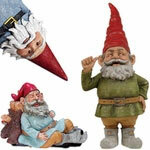 These loveable figures put a modern twist on the classic gnome garden art. Our whimsical metal gnome garden stakes include a red-hatted male figure holding a red and white mushroom and a blue-hatted female holding a white daisy. Purchase these together or separately to add an adorable touch to your yard. 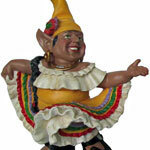 For the groovy guys or gals in your life, try our hippie dude and hippie chick gnomes. This treasured retro couple is clad in flower power and peace signs, ready to add a relaxed vibe to your home or garden. Our other retro couple comes from the 1950s, when sock hops and roller skates were all the rage. 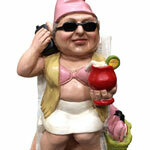 Purchase our The Fonz gnome and his gal, a poodle skirt-wearing pink lady. This pair of cool cats is the perfect gift for your nostalgic friends or family. Our couple gnomes even include Christmas figures. Every home needs a set of Santa and Mrs. Clause garden gnomes during the holidays. 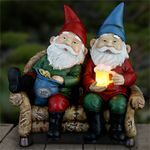 These gnomes come with a festive red hat and pom-pom on top to fit right in with your holiday lights and other decorations. We love keeping our Santa and Mrs. Clause gnomes in our gardens to keep the Christmas spirit alive year round. 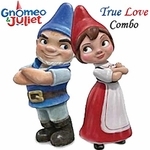 Don�t forget to add our biker couple gnomes to your collection. These hell-raising couples include our biker dude and biker babe gnomes. Our biker babe comes complete with a leather bra while her biker man has a tough skull necklace and leather vest. This pair means business. 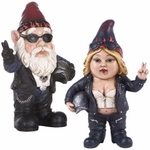 If our biker couple is too tough for you, make sure to check out our classic male and female lawn gnomes. These simple and friendly originals are always a welcoming addition to any backyard!